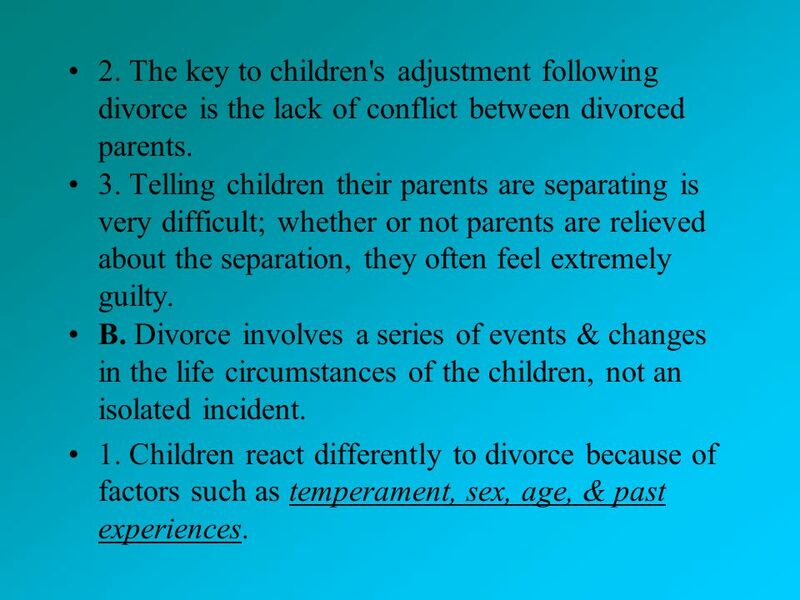 An optimistic versus catastrophic thinking style can be a determining factor in how a child copes with the divorce. Parents can have a great deal of influence in helping children realistically assess situations and avoid catastrophic thinking patterns that assume the worst of situations.... Storytelling and Difficult Subjects: Divorce and Separation. With more and more families breaking up with parents separating or divorcing, there is an ever increasing need to help our children understand what is going on and why, should they find themselves in the middle of one. Your children may try to protect you and the other parent by not expressing these feelings to you. Be careful not to underestimate what your children are going through as they will need your support at this time and positive reinforcement of the role the other parent will be playing in their lives will help them greatly during these early days.... I have to say that my heart just broke reading this post and imagining how difficult it is for kids to find out their parents are separating. I’m really glad you’re sharing your own experience to help others make the process as painless as possible for their own children. Explain that your child will continue to see both parents. If your preschooler has witnessed a lot of arguments, acknowledge that fact and explain that you're trying to do what's best for the family. If your preschooler has witnessed a lot of arguments, acknowledge that fact and explain that you're trying to do what's best for the family.... Just wanted to say that I remember when my parents told me & my brother they were going to separate. My mum told us alone because my dad didn't want to separate. I was upset and a bit stressed about it, but I think we had seen it coming because there was a lot of arguing in the house. I was 7 when they told me and my brother 5. Then the parents would say they were separating, and the child would cry and run out of the room in tears, knowing their world had just fallen in and that life would never be the same again."